What’s trending in the April 2019 QST. Views expressed in this Amateur/Ham Radio post are those of HQ ARRL, its reporters, and its correspondents. Content provided by HQ ARRL, 225 Main St, Newington, CT, 06111. Accessed on 19 March 2019,, 0350 UTC, Post 902. Please click link or scroll down to read the full message from the ARRL. Go online and start reading this issue, now! After you’ve read this issue, remember to vote for your favorite article. ARRL members can read and download the digital edition on an iPhone, iPad, iPod touch, Android tablets & phones, and Kindle Fire devices. Read QST online or choose to download individual issues for offline reading on the mobile applications. The QST apps are FREE! Important: There is a known bug with the Apple version of the QST app which may prevent downloading issues. ARRL has confirmed with the app developer that version 5.0 of the app, introduced in early February, may produce instances of the app crashing on some devices when the user tries to download an issue ofQST for offline reading. We apologize for this inconvenience, and we are working with the developer to resolve this issue as quickly as possible. What is a digital edition? The digital edition of QST is an electronic form of the journal. 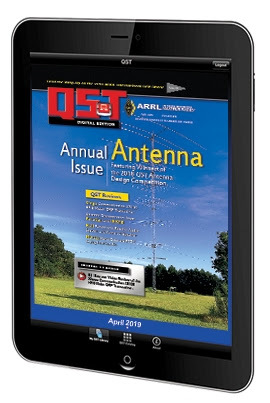 All ARRL members have access to the digital edition of QST…a way to read and interact with the current issue of QST anytime, anywhere. Each issue includes unique, digital-edition-only content such as video, audio features and extra content. Members can also access the digital archive for access to previous issues. QST can be read online or downloaded onto some devices. Members must have a valid ARRL website login to access this benefit. You can always find a link to the current digital edition and archives at www.arrl.org/qst. The web version is optimized to automatically recognize most mobile devices, tablets and e-book readers. Apple iOS device users (iPhone, iPad and iPod touch), Android device users, and Kindle Fire users can also access the digital edition from a dedicated QST app. The app is free in Apple’s App Store the Google Play Store, and the Amazon App Store, or search for “QST”. When prompted to sign into the digital edition, use your ARRL website registration username and password. Not registered? Go to www.arrl.org/myarrl. Forgot password? Go to www.arrl.org/forgot-password to reset your password. Not a member? Join today and get access to the current digital edition, now. Need help? Visit the digital edition help page for frequently asked questions. Need more help? Contact Member Services by telephone 860-594-0200 or 888-277-5289 (US only) or email circulation@arrl.org. You can choose to opt-out* of the mailed, print edition of QST at any time. Complete our online opt-out form. Due to the lead time required to prepare QST for mailing, you may receive one last printed issue. * Disclaimer: Choosing to opt-out of the print edition ofQST is voluntary and will not result in a refund or reduction of ARRL membership dues. Any savings will be used to extend the ARRL’s reach in the areas of public service, education, advocacy, technology and membership.